Two different evenings (I am not a morning person), two different light experiences. I couldn’t decide between two and so I am breaking what is surely some rule that says to post only one shot. I am posting two this week. Feedback appreciated. Which photo works better within the theme? More postcards from Washington, D.C. Nothing new here, photographically. On the other hand, this blog is turning out to be, for me, a diary, or a breadcrumb trail, if you will, of what I was doing during a portion of each week of this year. 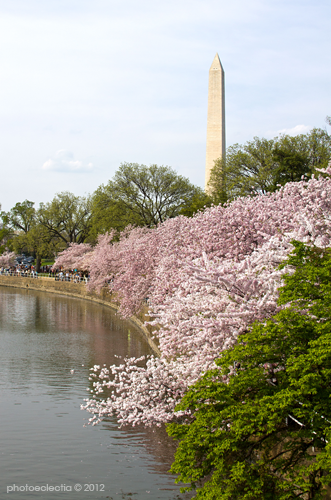 My story this week was a walk around the Tidal Basin, along with a hefty portion of the people from my workplace and 10,000 tourists, many of them Japanese, to see the cherry blossoms at their height of glory. 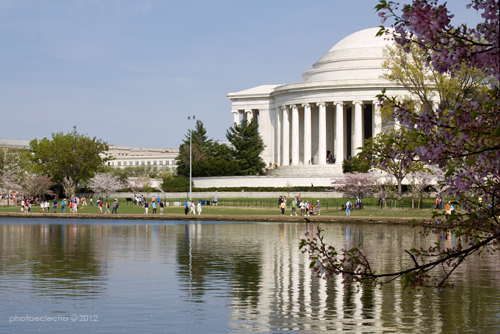 It was a beautiful day (although somewhat warm), and someone had suggested resurrecting the long defunct yearly tradition of trooping up to the Tidal Basin en masse to celebrate this icon of springtime in Washington. Very fun.